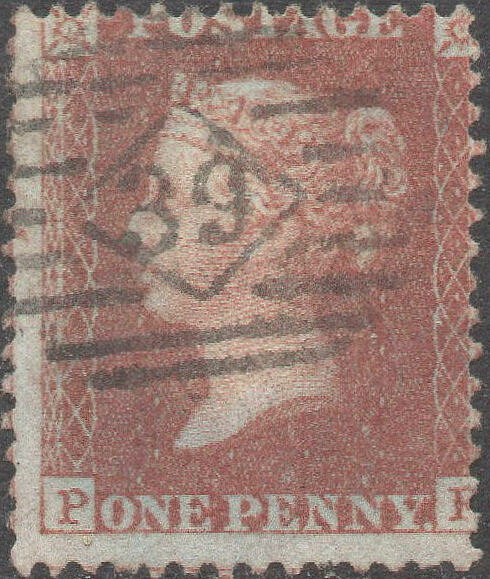 1855 1d Red Perf Die II, Alphabet III (Blued Paper) SG29-33 etc. (Spec. 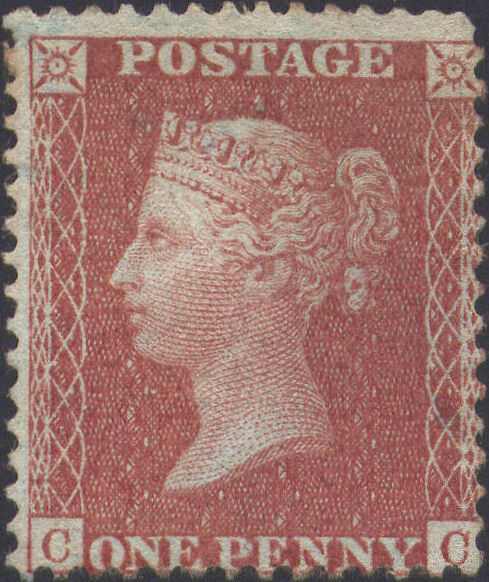 C7-C8). 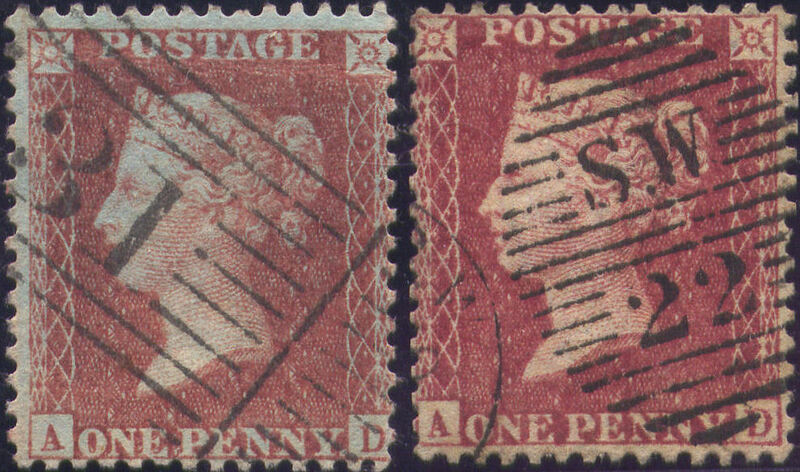 NOTE: What are described as CONSTANT VARIETIES in the listings for these issues are generally features described and illustrated in 'Penny Red Stars', Parts 1 and 2, by Wiggins and Tonna. 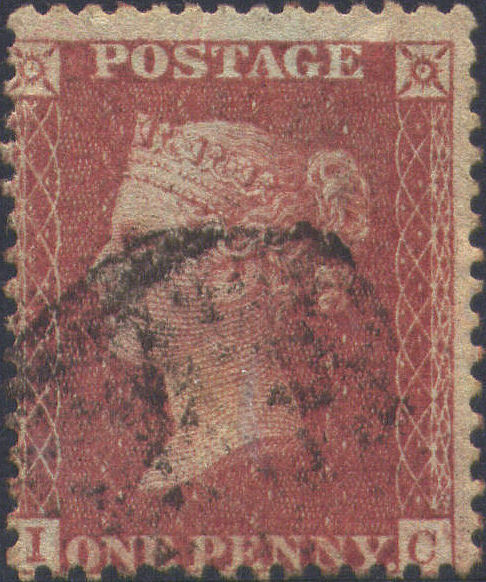 A FU single from the RARE ABNORMAL SMALL CROWN issue, from one of the RAREST PLATES, reasonably WELL-CENTRED for these, with FULL PERFS, but rather heavily cancelled with a Scots numeral. Distinctive TALL 'L' (misplaced left); also blur SW. Cat.£3000. 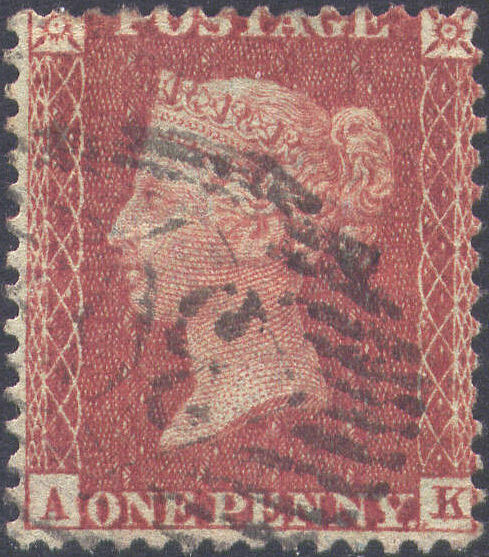 A FU single from the RARE ABNORMAL SMALL CROWN issue, WELL-CENTRED for these, with nearly FULL PERFS (one short upper E), but corner crease SW, neatly cancelled low left with a London District duplex, leaving much of the HEAD CLEAR. 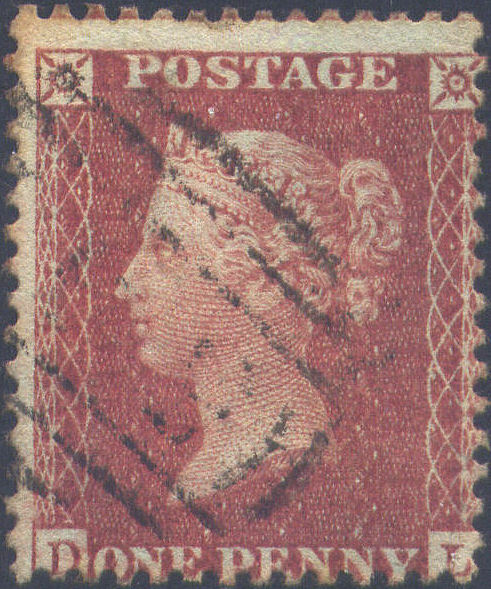 Blurs NE, upper E, SE and SW, and 'C' tilted E. Cat.£950. 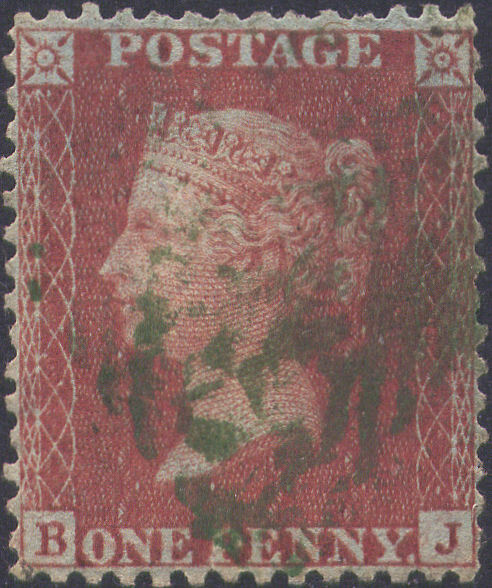 A GU+ single from the RARE ABNORMAL SMALL CROWN issue, from one of the SCARCER plates, off-centre left, with FULL PERFS, but corner creases NE, cancelled with a Scots numeral. Blurs upper E, and letters misplaced right. Cat.£1500. 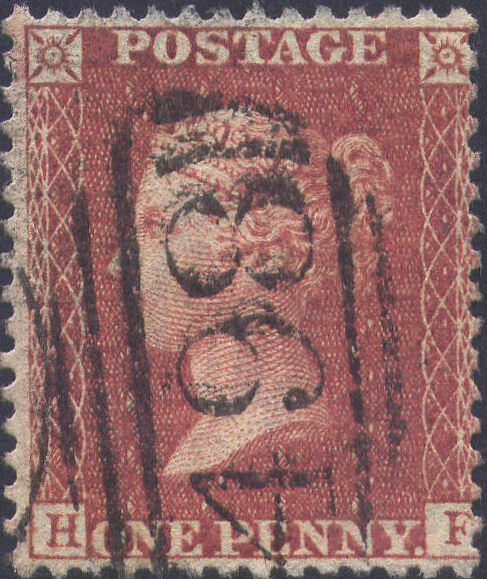 A FU single from the RARE ABNORMAL SMALL CROWN issue, from one of the SCARCER plates, off-centre high right, but with FULL PERFS, lightly cancelled with a neat London Inland '39' numeral. 'P' misplaced low right, with extended lower serif. Cat.£1500. 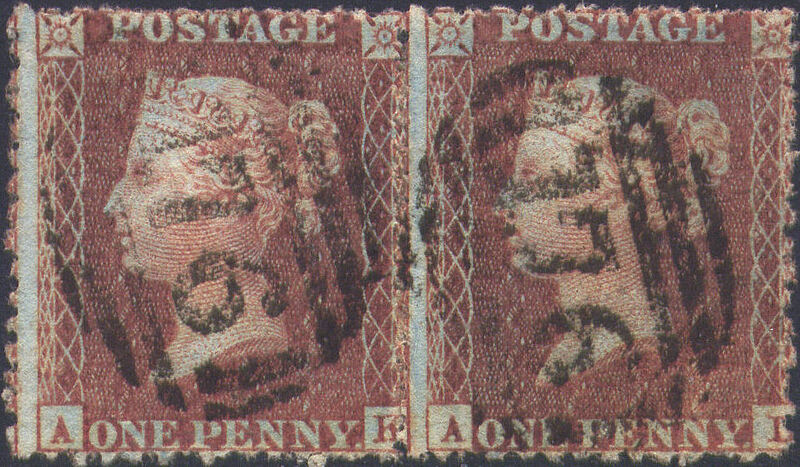 A VFU RARE HORIZONTAL PAIR from this RARE plate, off-centre low, but with FULL PERFS, on a neat small DATED PIECE of 11 JUNE 1856, neatly cancelled with a GLASGOW '159' 'MADELEINE SMITH' experimental duplex. 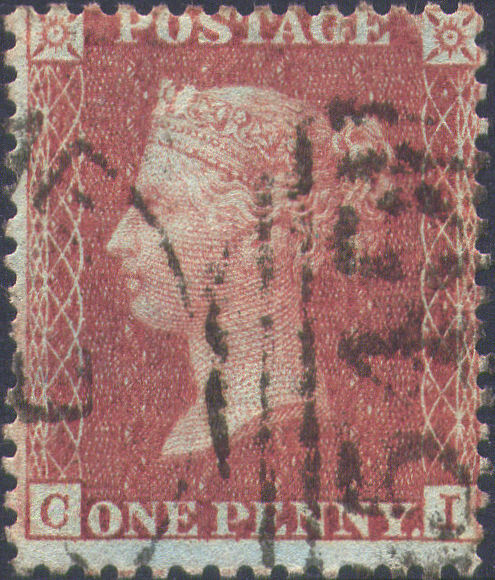 CONSTANT VARIETY 'II': blur SW; also upper E blurred on both, and narrow margin between. 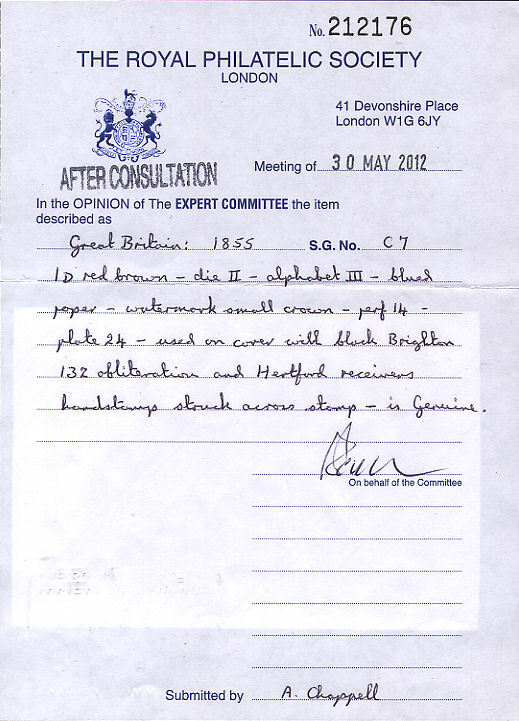 MIKE WILLIAMS CERTIFICATE. Cat.£1400+. 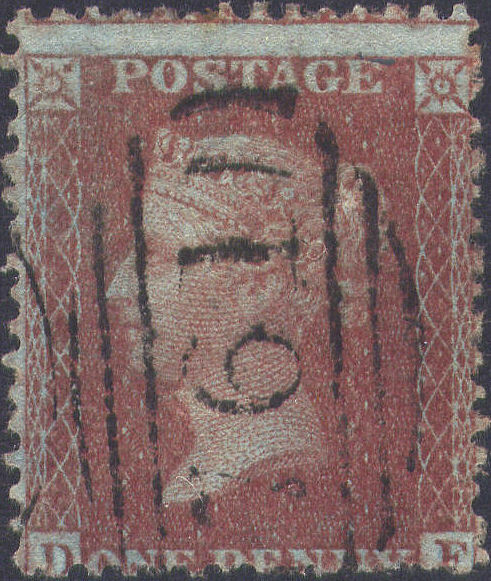 A VFU single from this SCARCER plate, WELL-CENTRED, with FULL PERFS, lightly cancelled with a neat Ipswich '405' SIDEWAYS DUPLEX. 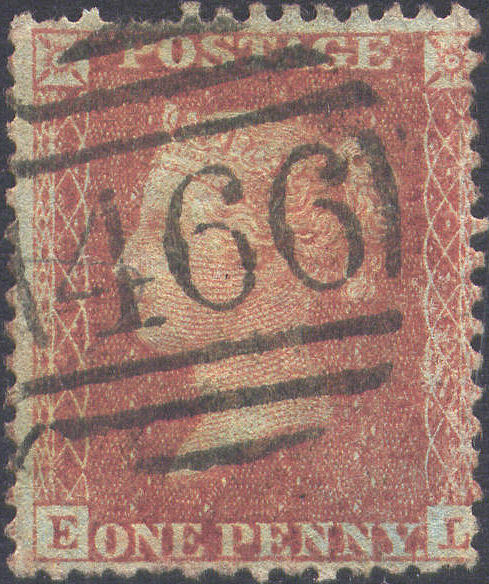 CONSTANT VARIETY: dot in 'C'. Cat.£50+. 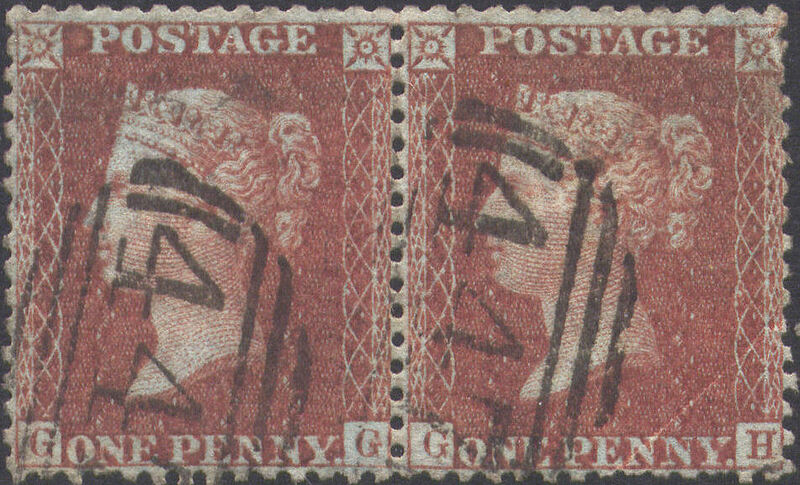 A MOST UNUSUAL VFU/GU HORIZONTAL PAIR from this SCARCE plate, WELL-CENTRED, with FULL PERFS, but corner crease 'GH', neatly cancelled with Leeds '447' numerals. Narrow margin between, and W 'G's misplaced right. Cat.£130+. 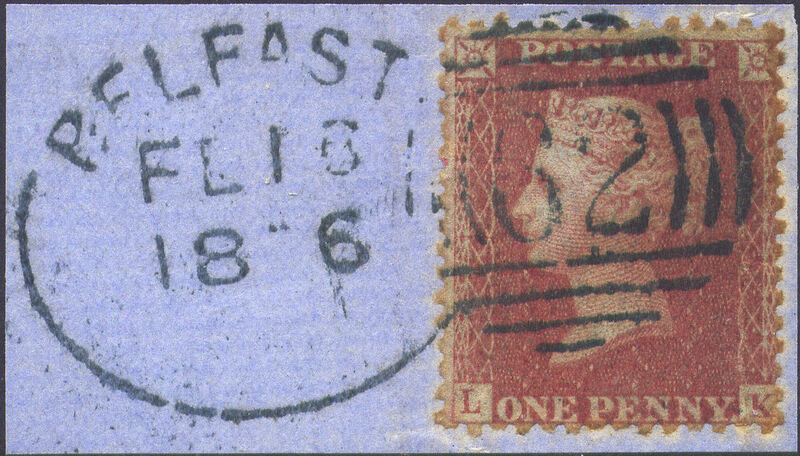 A FU+ single from this slightly SCARCER plate, off-centre high right, but with FULL PERFS, neatly cancelled with a BELFAST SPOON. GOTHIC 'K' misplaced low left, and 'R' misplaced low. Cat.£35+. 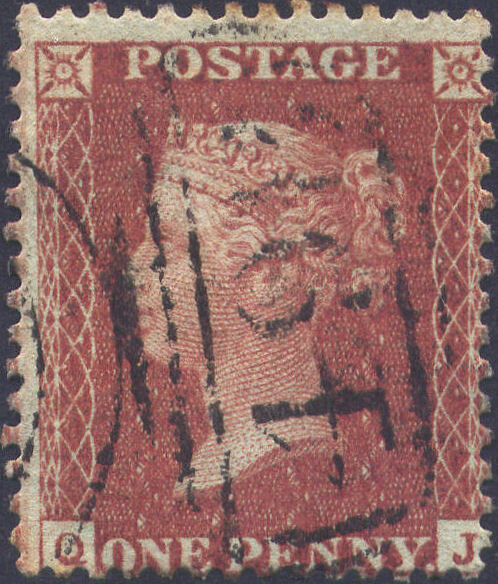 Ex WIGGINS, a VFU single from this slightly SCARCER plate, centred slightly high, with FULL PERFS, neatly cancelled with a Scots numeral. 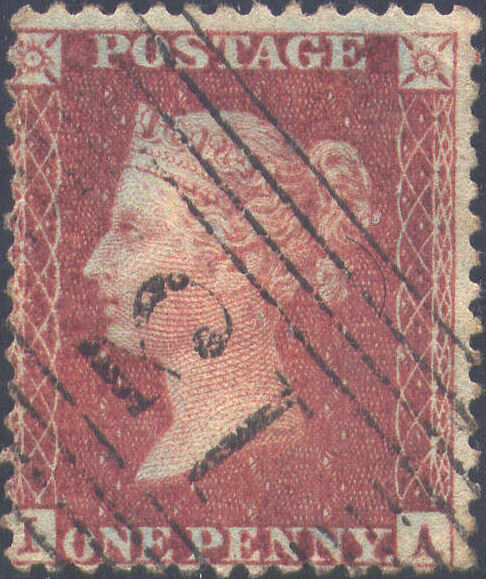 A MISSING IMPRIMATUR, showing blurs E, and letters misplaced low and low right, with the 'A' blind. Cat.£25+. 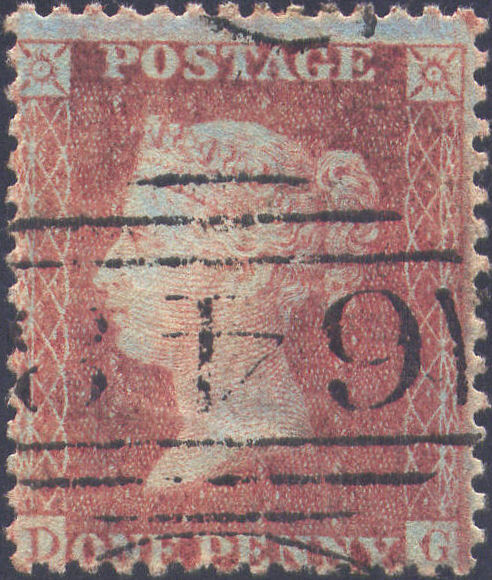 A VFU single from this slightly SCARCER plate, centred a whisker low, with FULL PERFS, lightly cancelled with an English Provincial numeral. GOTHIC 'K' misplaced low left, and blur outside SE. 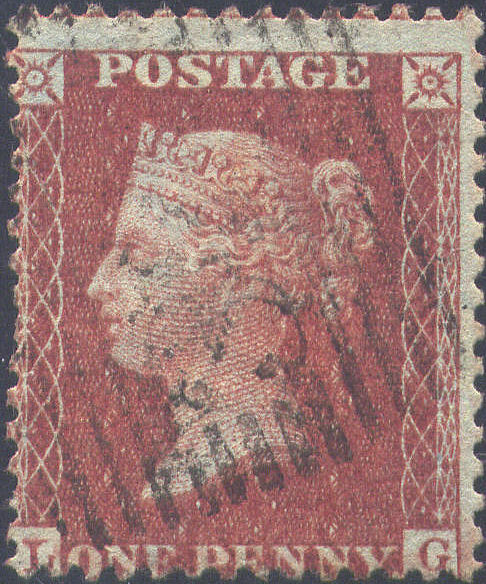 Cat.£35. 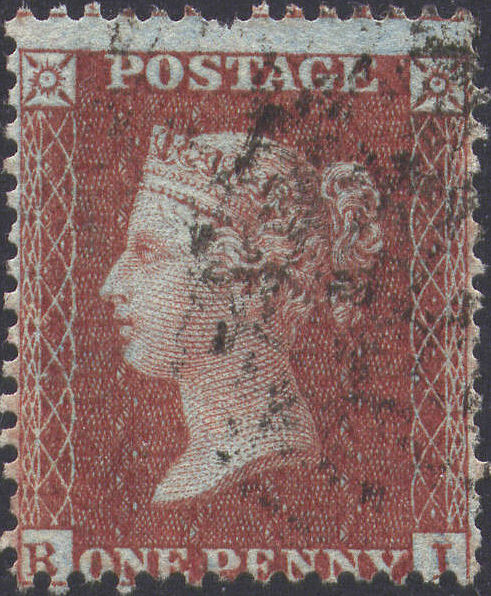 Ex WIGGINS, a FU+ single from this slightly SCARCER plate, off-centre left, but with FULL PERFS (rough perfs caused by blunt pins), VERY LIGHTLY cancelled with an English Provincial numeral. 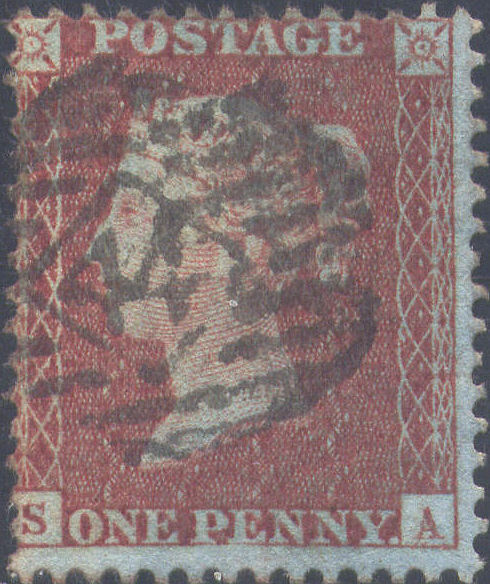 CONSTANT VARIETIES: blurs SE and SW (very faint), and letters misplaced low and low right. Cat.£25+. 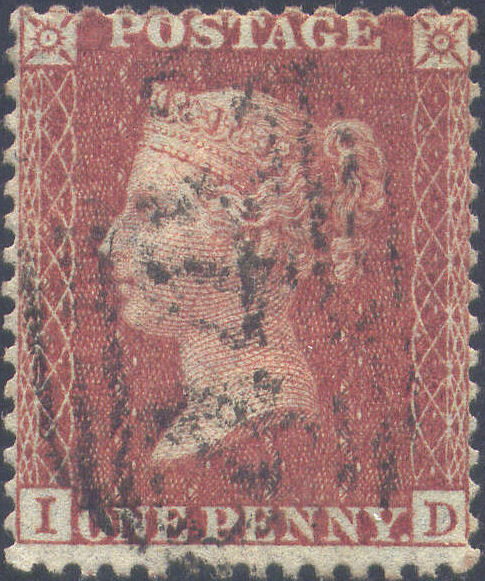 A VFU single from this slightly SCARCER plate, WELL-CENTRED, with FULL PERFS, neatly cancelled with an EDINBURGH ROLLER. 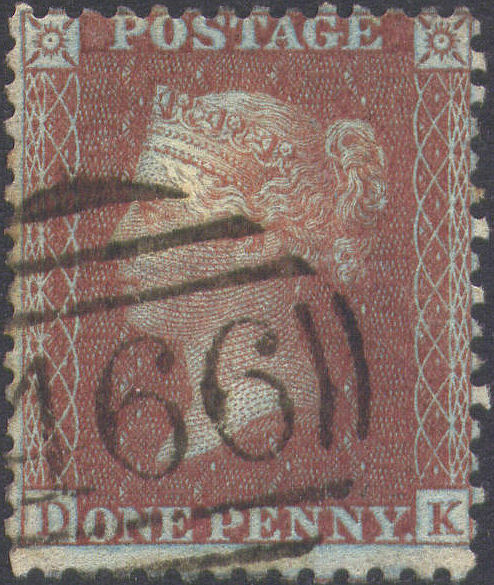 A MISSING IMPRIMATUR showing letters tilted W and E respectively. Cat.£25+. 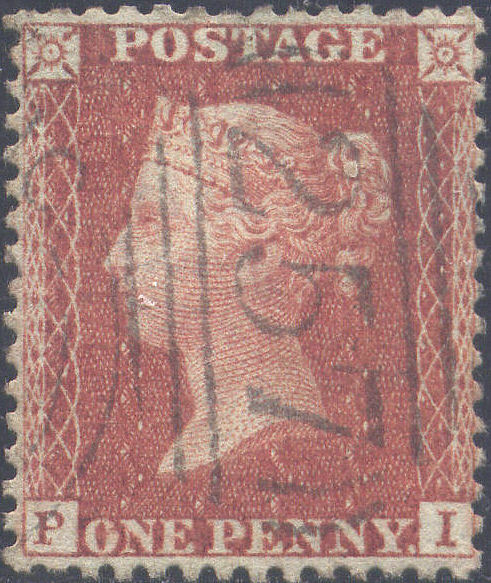 A FU+ single from this slightly SCARCER plate, in a FINE BRIGHT BRICK-RED shade, off-centre low right, but with FULL PERFS, neatly cancelled with an English Provincial numeral. 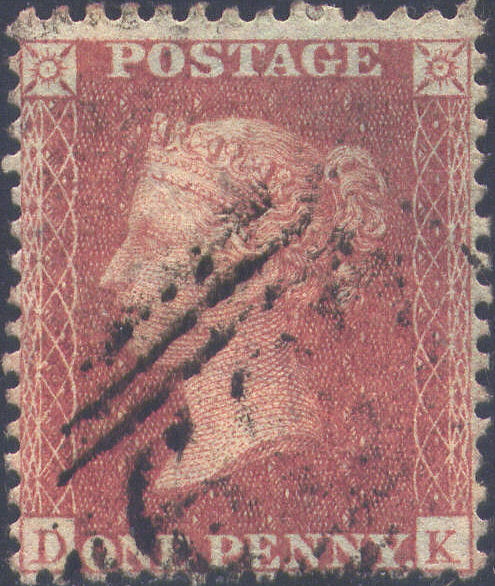 'D' sloping W. Cat.£45+. 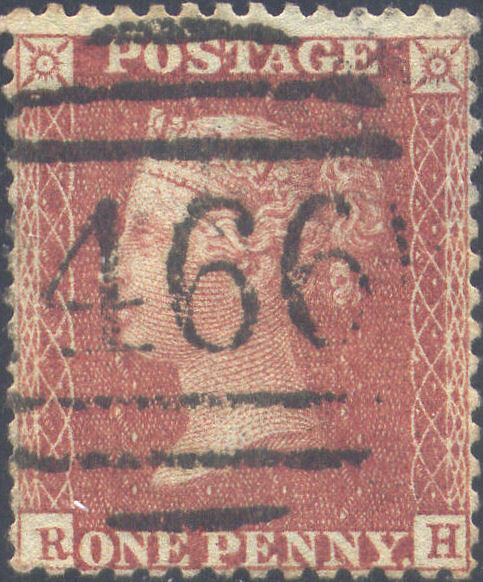 A FU+ single from this slightly SCARCER plate, off-centre high, but with FULL PERFS, neatly cancelled with a VERY SCARCE ISLE OF MAN '407' numeral (Parmenter RARITY 'F' - 'RARE'). 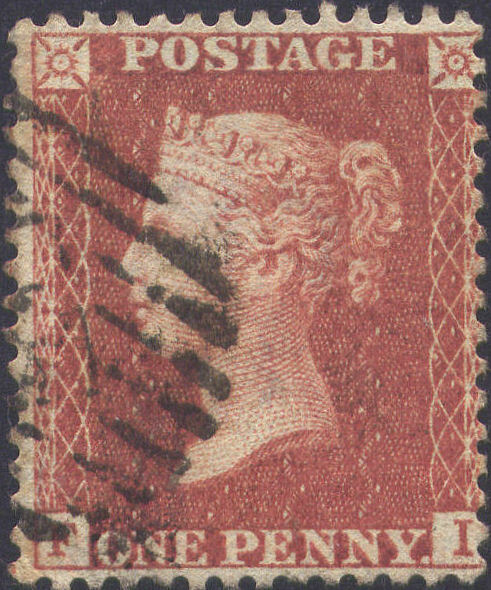 'F' slightly high, and 'I' tilted slightly E. Cat.£25++. 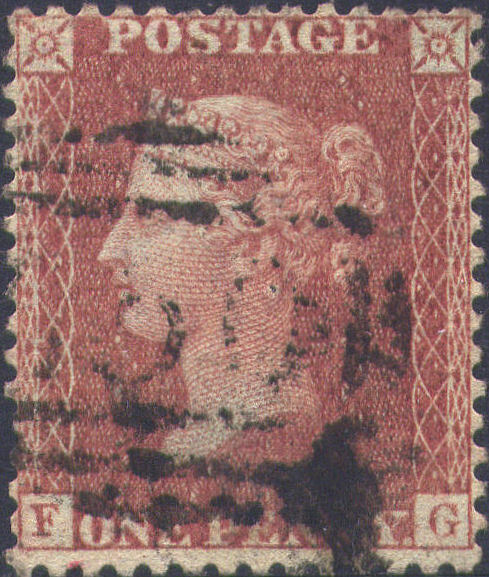 A FU+ single from this slightly SCARCER plate, in a BRICK-RED shade, off-centre low left, but with FULL PERFS, lightly cancelled with a Scots numeral, leaving COMPLETE CLEAR PROFILE. 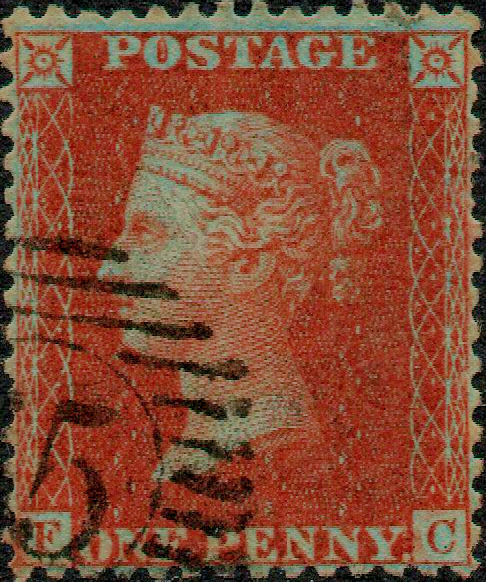 CONSTANT VARIETY: blur above toe of 'L'; also blur outside SE, and letters misplaced low right and right, with the 'G' tilted E. Cat.£45+. 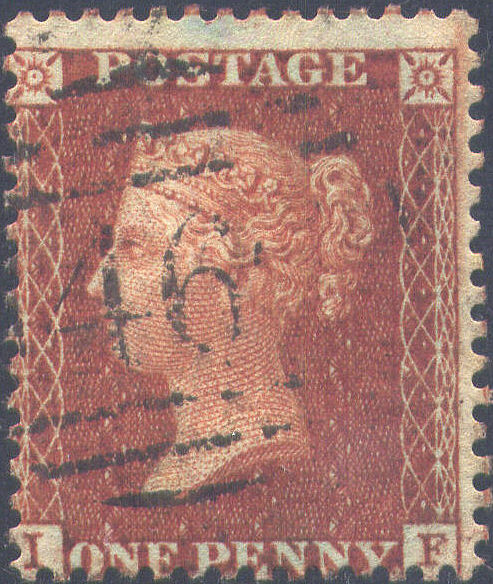 A FU single from this slightly SCARCER plate, in a deepish BRICK-RED shade, off-centre high, but with FULL PERFS, cancelled with an English Provincial numeral. GOTHIC 'K' (misplaced low), and blur outside SE. Cat.£45+. 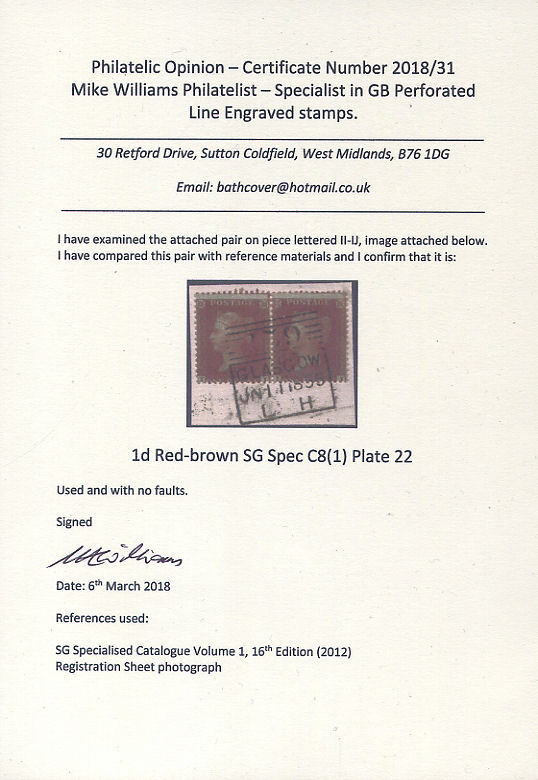 A VFU/FU RARE MATCHED PAIR, both WELL-CENTRED, the C8 in a fine BRICK-RED shade, and the C9 in a VERY PALE SAVOY STREET PALE ROSE shade, both with more or less FULL PERFS, but the C9 with some perf-tips trimmed E and S, cancelled respectively with a FINE RARE LODDON (Norfolk) '578' numeral in OLIVE-GREEN, and a Ripon '646' numeral. 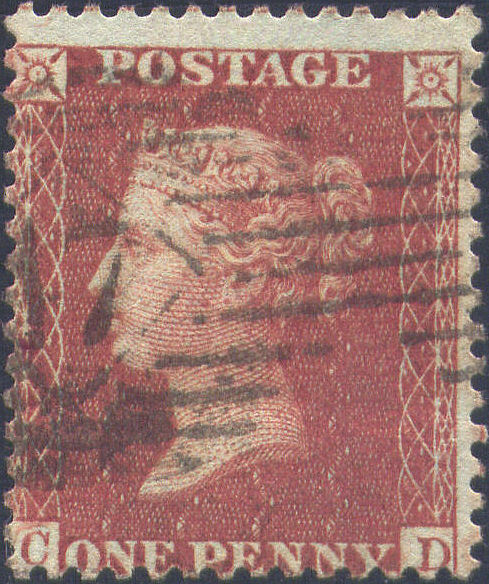 Upper E blurred, 'B' misplaced right, and 'I' tilted W. NOTE: SG suggest (p134) that 'some 'olive' cancellations can be found from...the 'Western' district...during 1855-56, but are believed to be due to excessively oiled blue inks'. 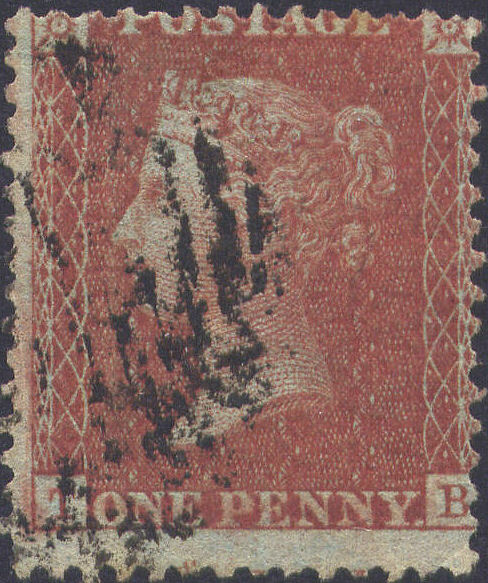 This cancellation (from East Anglia) is not at all 'oiled', and could not be described by any stretch of the imagination as 'blue'. Cat.£530+. 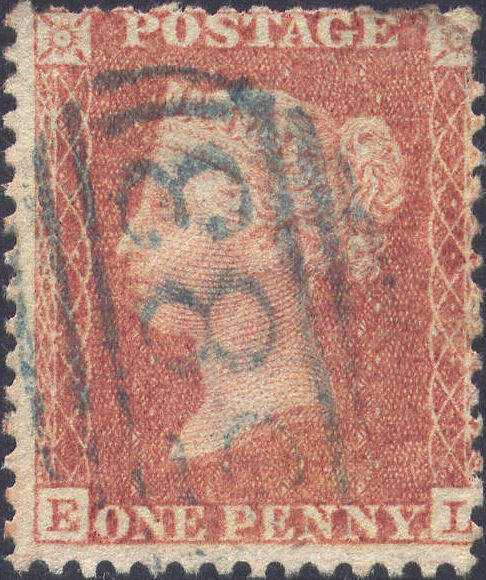 A VFU single, centred somewhat high, but with FULL PERFS, neatly cancelled with a Liverpool '466' numeral (probably a SPOON). GOTHIC 'K' tilted W, and 'D' misplaced right. 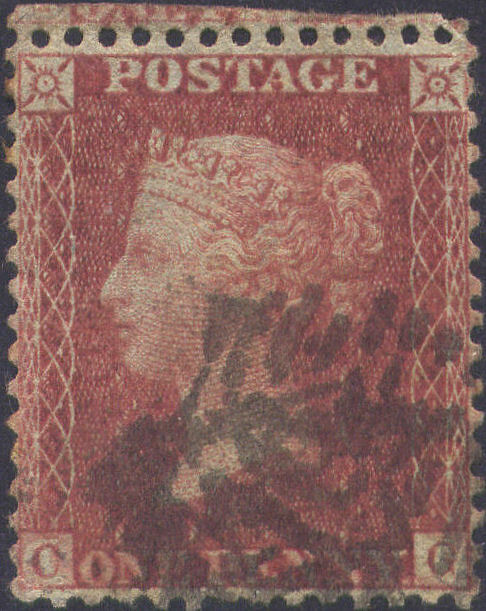 Cat.£35. 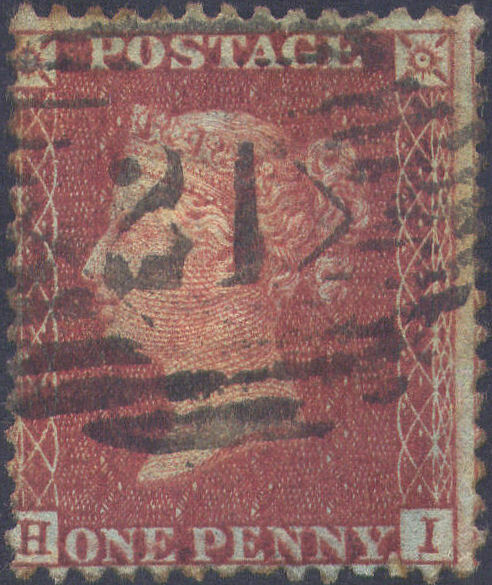 A VFU single, in a bright Red-brown shade approaching BRICK-RED, centred a whisker low left, with FULL PERFS, neatly cancelled with an EDINBURGH ROLLER. E margin narrow, NE weak, 'I' tilted slightly W, and 'A' blind and misplaced low. Cat.£22+. 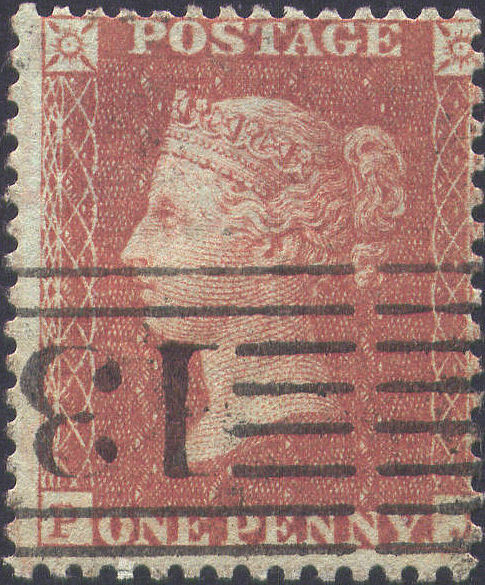 A VFU single, centred slightly high, with FULL PERFS, lightly cancelled with an English Provincial numeral. 'D' misplaced slightly low. 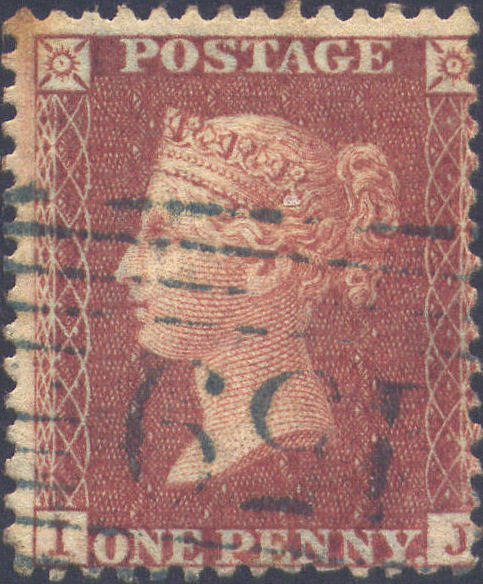 Cat.£22. 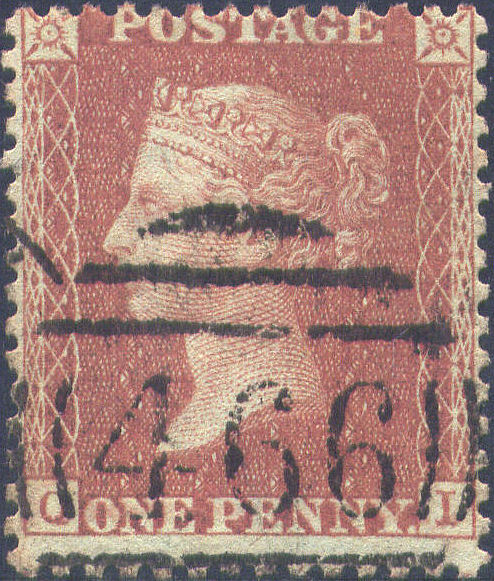 A FU+ single, off-centre high, but with FULL PERFS, neatly cancelled with a Leicester '449' numeral. 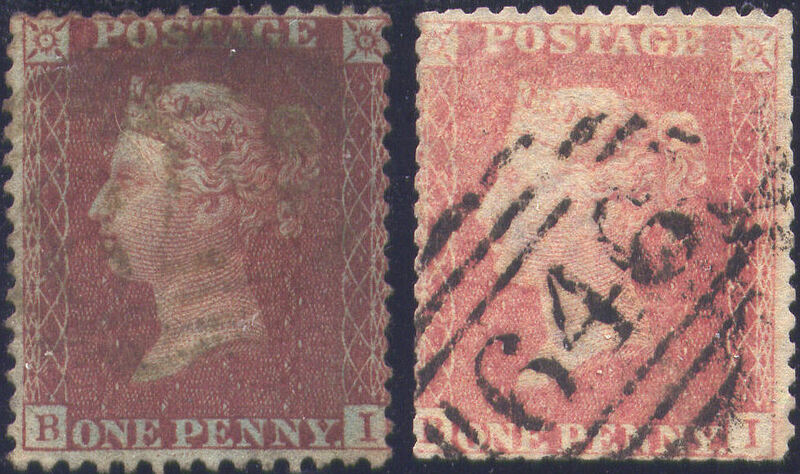 CONSTANT VARIETY: verrtical scratch in NW corner of 'P square; also letters misplaced right and low right. Cat.£22+. 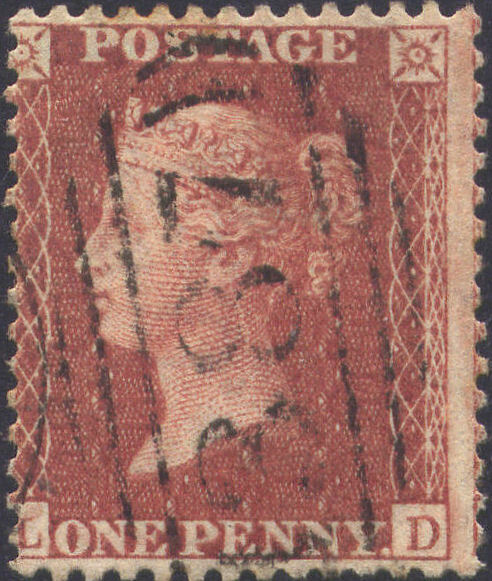 A VFU single, WELL-CENTRED, with FULL PERFS, lightly cancelled with a London Inland '30' numeral. 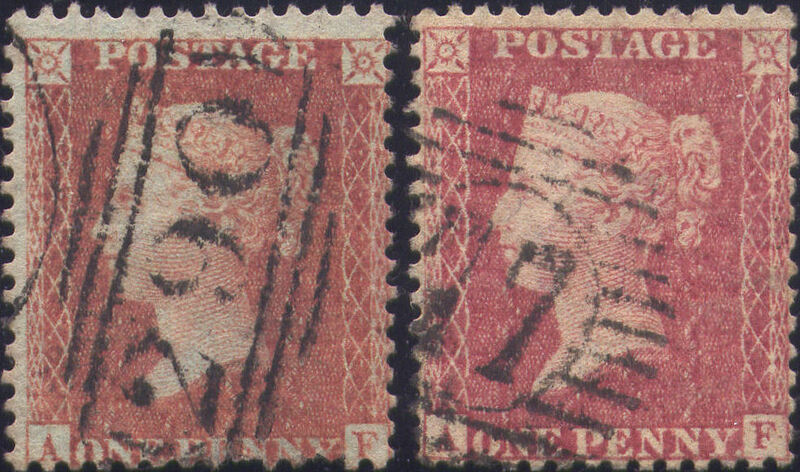 A MISSING IMPRIMATUR and SHORT STAMP (TWO perf rows), showing CONSTANT VARIETY: dot in SW corner of 'K' square. I also believe that the 'K' is slightly DOUBLED. Letters are misplaced low and right respectively. Cat.£22+. 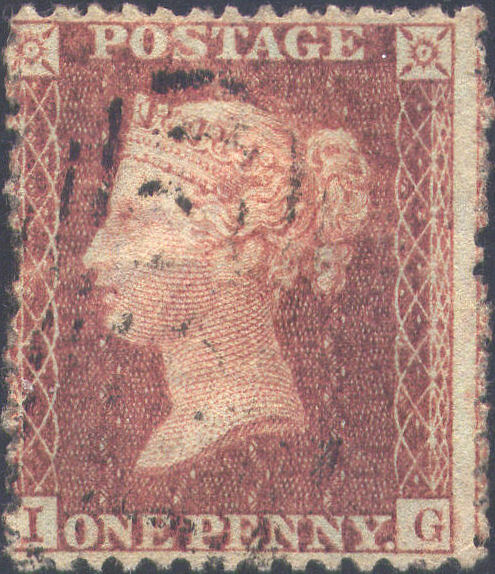 A VFU single in a strong Red-brown shade approaching BRICK-RED, centred slightly low left, but with FULL PERFS, lightly cancelled high right with an English Provincial numeral, leaving almost COMPLETE CLEAR PROFILE. E 'D' misplaced right. 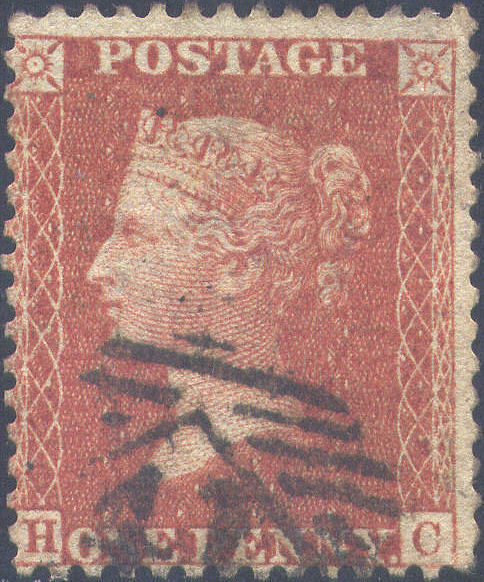 Cat.£22. 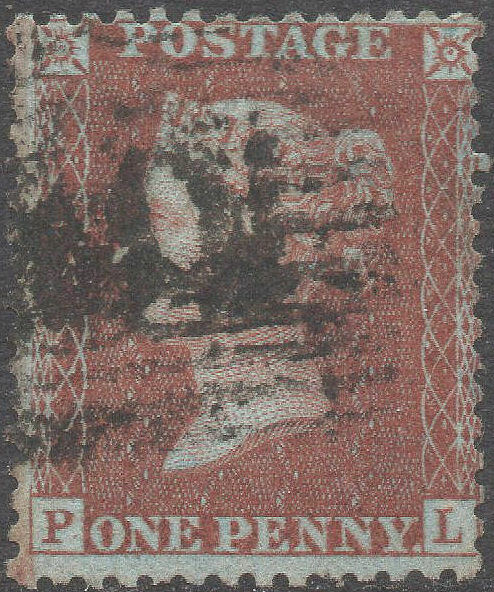 A FU+ single, WELL-CENTRED, but with a couple of short perfs N, neatly cancelled with a LIVERPOOL SPOON. 'L' misplaced low right with extended serif. Cat.£22+. 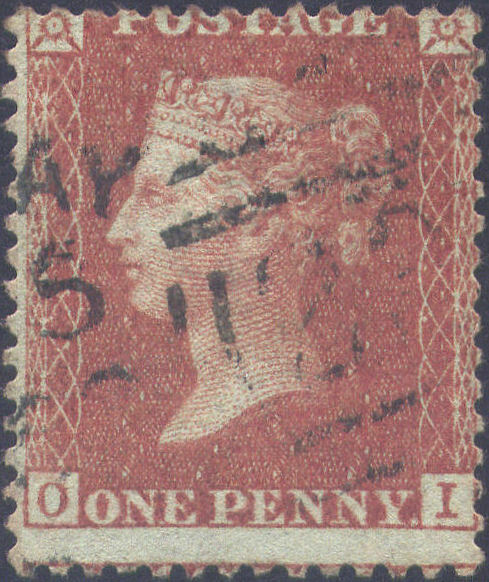 A VFU single, centred slightly low left, but with FULL PERFS, lightly cancelled high with an English Provincial numeral, leaving partial CLEAR PROFILE. 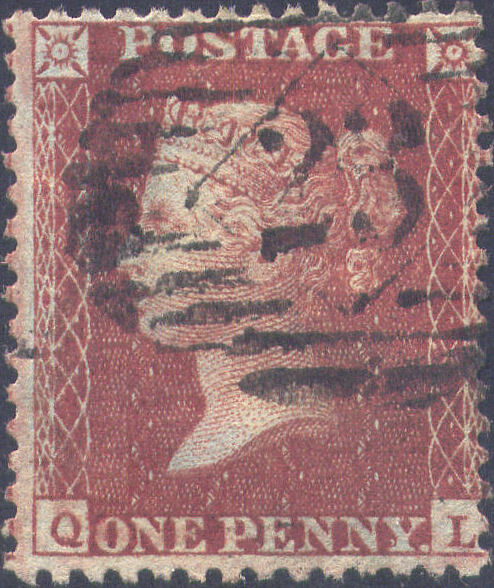 Heavy blur E, and 'J' misplaced right and tilted E. Cat.£22. 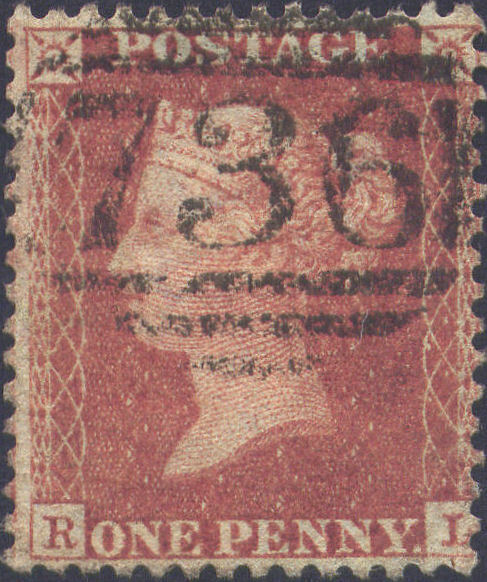 A VFU single, in a bright Red-brown shade approaching BRICK-RED, centred slightly low left, but with FULL PERFS, VERY LIGHTLY cancelled with an English Provincial numeral. 'A' blind. 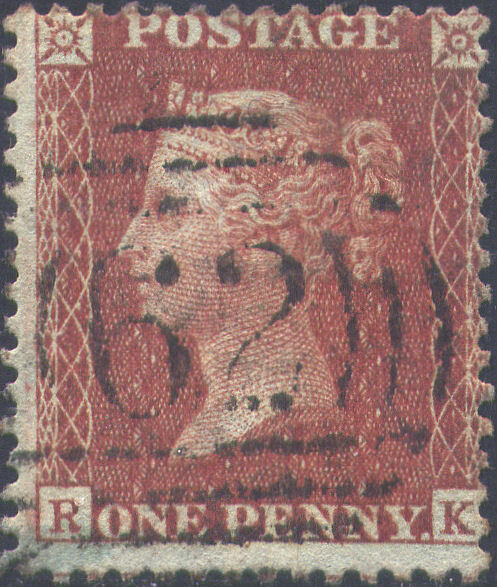 Cat.£22. 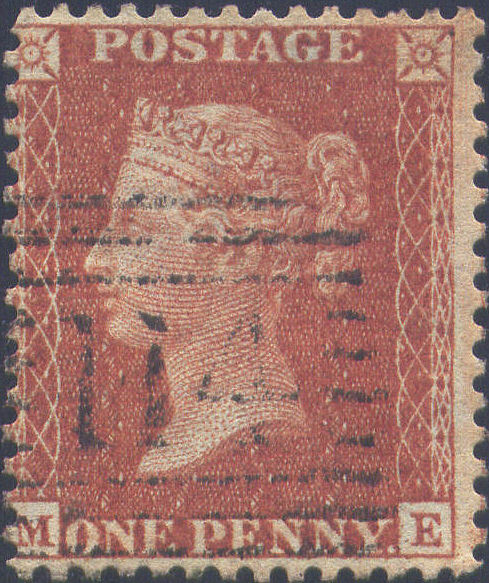 A VFU single, in a SCARCE PALE ORANGE-BROWN shade, centred a whisker low left, with FULL PERFS, lightly cancelled with a London District '71' duplex. Large 'M'. 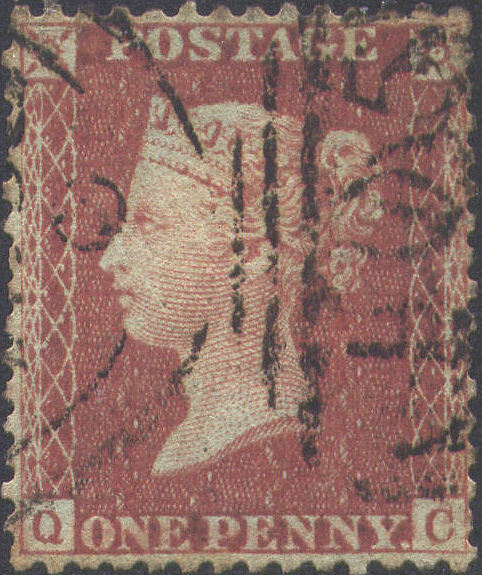 Cat.£60. 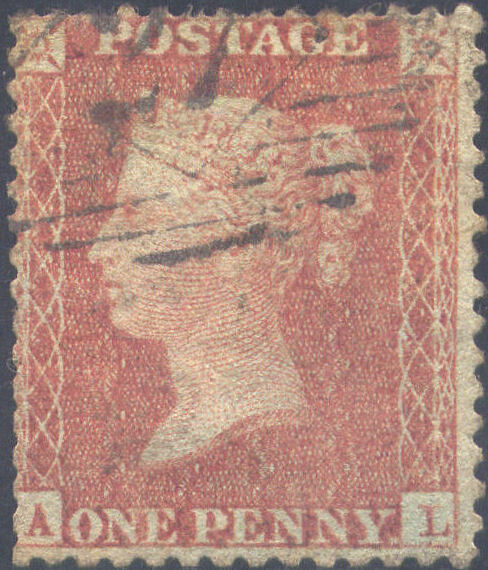 A VFU single, WELL-CENTRED, with FULL PERFS, lightly cancelled centre left with an English Provincial numeral, leaving much of the HEAD CLEAR. Letters misplaced right, with the 'L' tilted slightly E. Cat.£22. 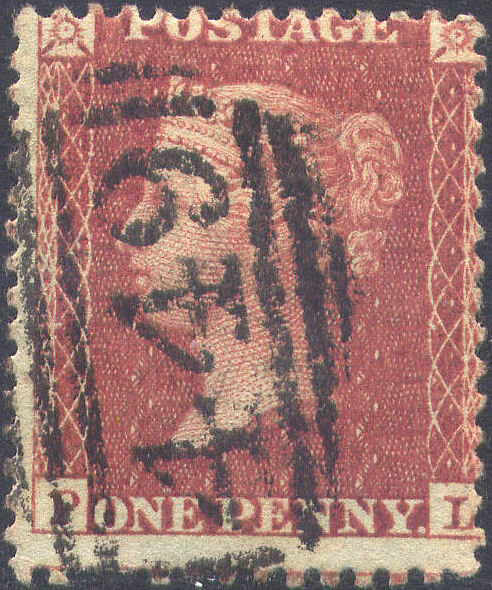 A VFU+ single, WELL-CENTRED, with FULL PERFS, lightly cancelled with a London Inland '28' numeral. NE corner frame-line extending N, blur NE, and 'F' misplaced high left. 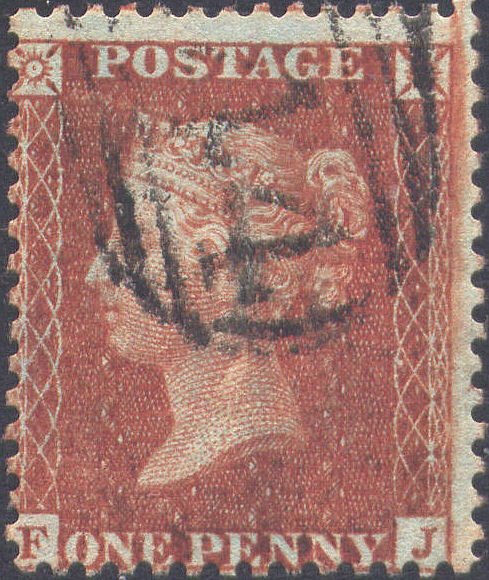 Cat.£22. 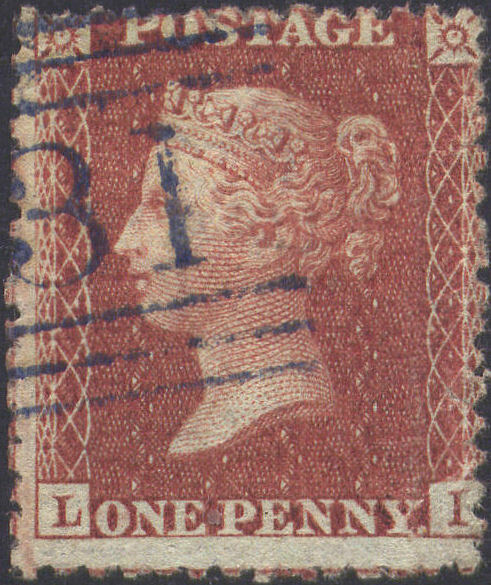 A FU+ single in a FINE SCARCE ORANGE-RED shade (on VERY BLUE paper), centred slightly high left, but with FULL PERFS, cancelled with a London Inland '44' numeral. Base-line weak, and 'A' misplaced low. 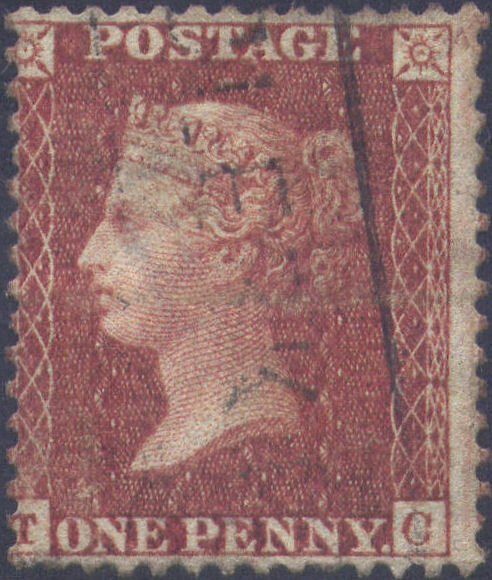 Cat.£140. 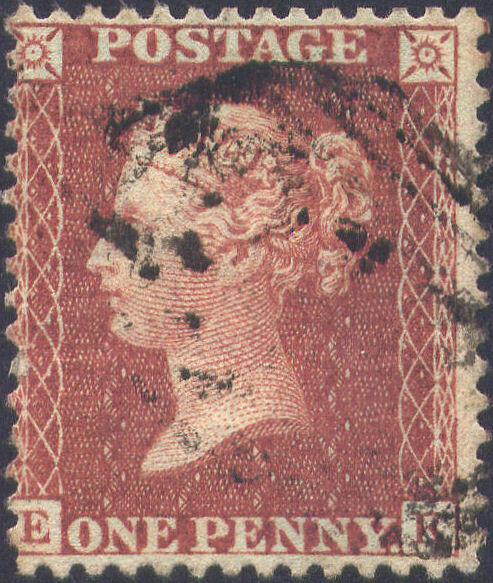 A VFU single in an UNUSUALLY PALE shade of Red-brown, centred a whisker high left, with FULL PERFS, VERY LIGHTLY cancelled high with a London Inland '27' numeral, leaving much of the HEAD CLEAR. 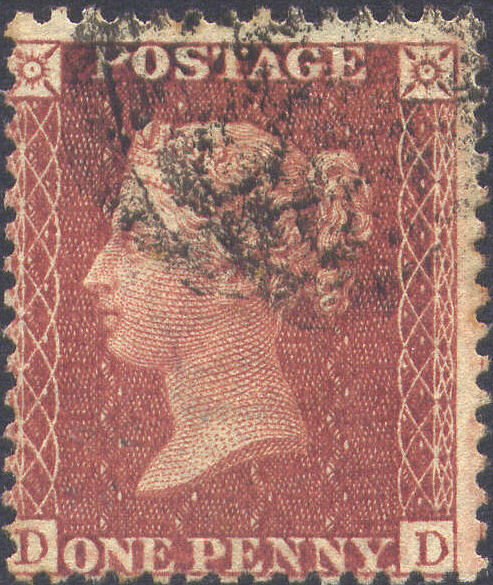 A MISSING IMPRIMATUR, with the letters misplaced low right, and the 'A' blind. Cat.£22+. 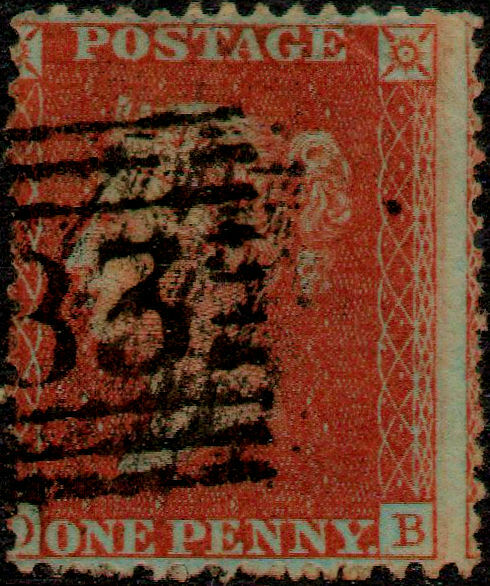 A VFU single, centred slightly low left, but with FULL PERFS, cancelled low with a London Inland '41' numeral, leaving virtually complete CLEAR HEAD. 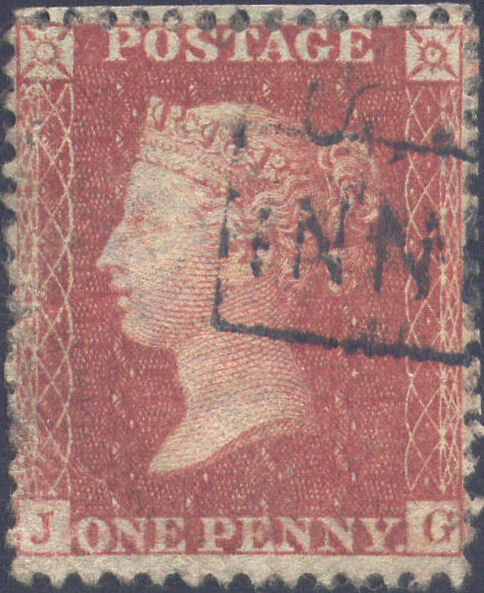 Top NE recut and extending slightly NE, and 'H' misplaced right. 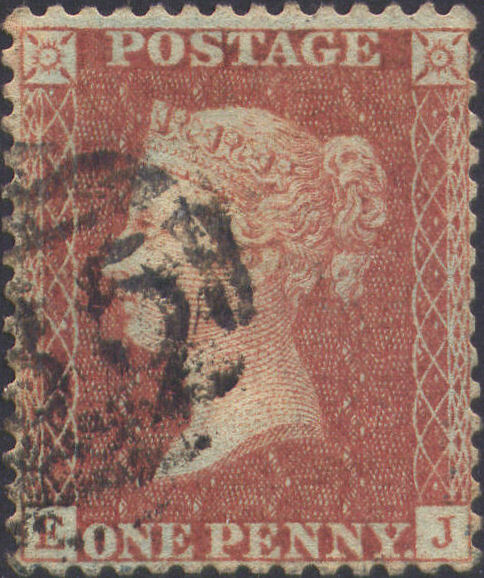 Cat.£22. 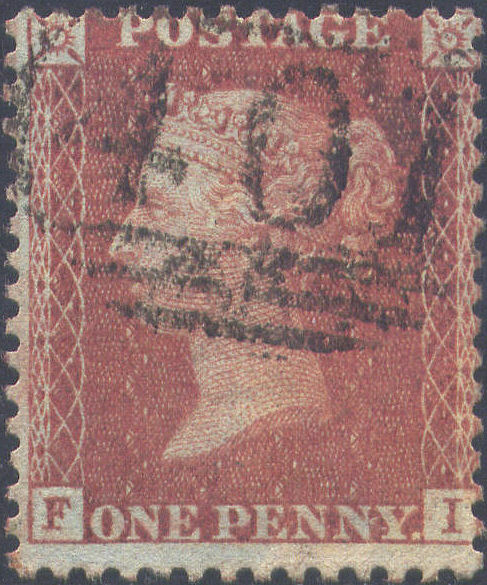 A VFU single in a FINE and SCARCE VERY DEEP ORANGE-BROWN shade, centred slightly low left, but with FULL PERFS, lightly cancelled with a Liverpool '466' numeral. 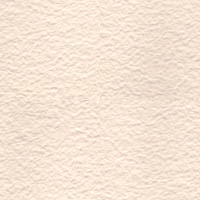 Upper E blurred, and 'I' misplaced left. Cat.£60+. 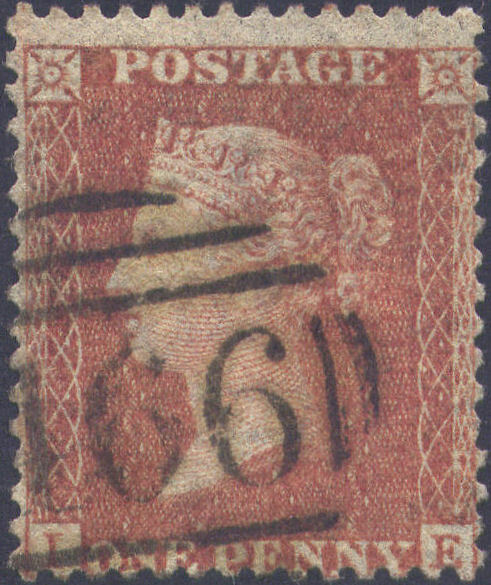 A VFU single, centred a whisker low, with FULL PERFS, neatly cancelled with a Liverpool '466' numeral. 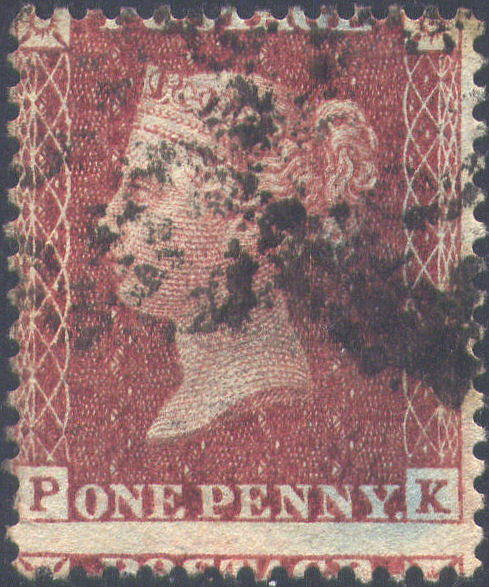 Letters misplaced low right and right, with the 'R' tilted W. Cat.£22. 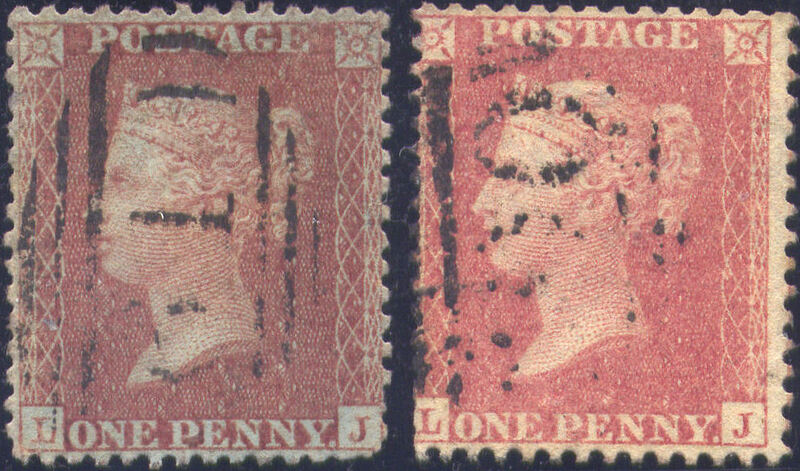 Both ex WIGGINS, a G-FU SCARCE MATCHED PAIR, in Red-brown on blued paper and SAVOY STREET PALE ROSE shades, both reasonably WELL-CENTRED, with FULL PERFS, but one or two minor perf faults, cancelled with English Provincial SIDEWAYS DUPLEXES. 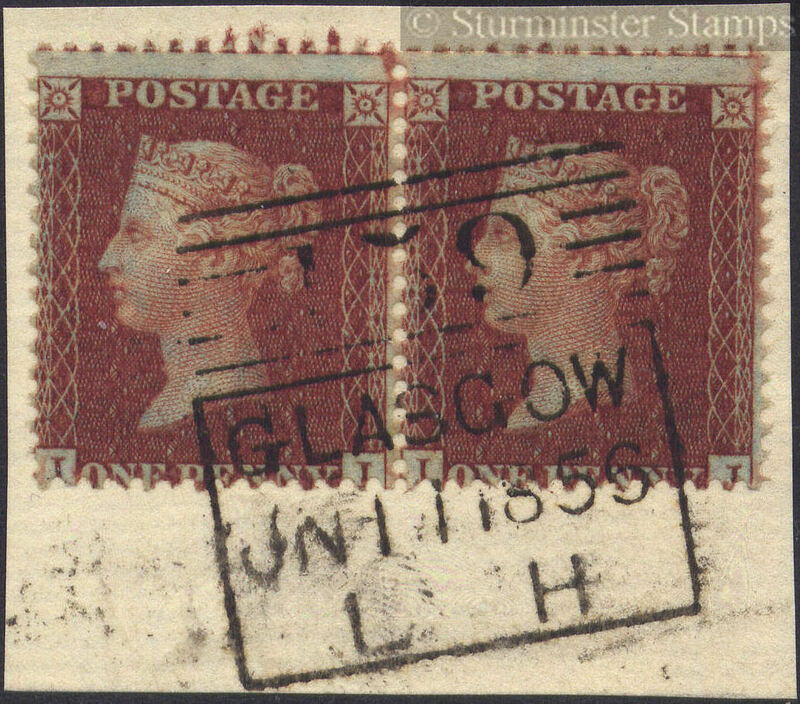 'L' misplaced low right, and 'J' tilted W. Cat.£92+. 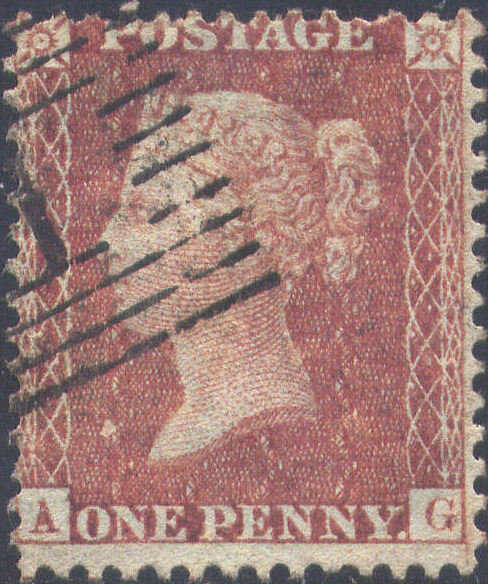 A VFU single, centred a whisker left, with FULL PERFS, lightly cancelled with a Scots Dundee '114' numeral. Large 'M' misplaced low right. 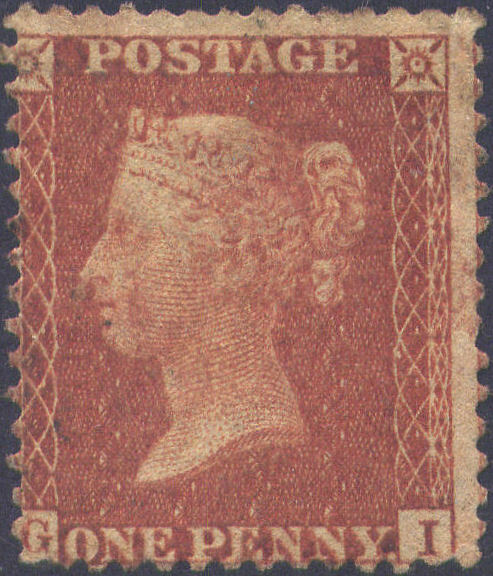 Cat.£22. 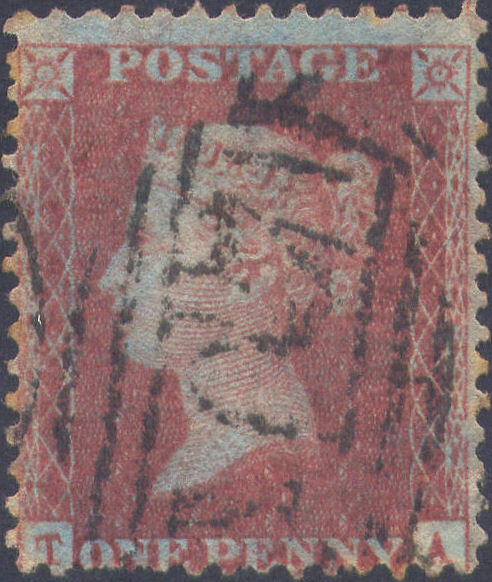 All ex WIGGINS, a F-VFU SCARCE MATCHED TRIO in a selection of shades of the period: BRICK-RED, SCARCE ORANGE-BROWN, and a SCARCE early TRANSITIONAL ORANGE-BROWN on TONED/BLOTCHED BLUE paper. 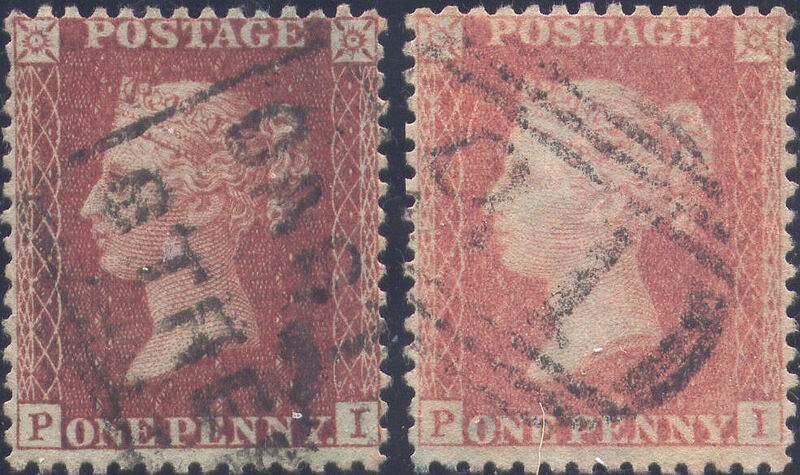 Variously centred, they all have FULL PERFS, and are cancelled respectively with a London Inland '16' numeral, and London District '78' and '71' duplexes. 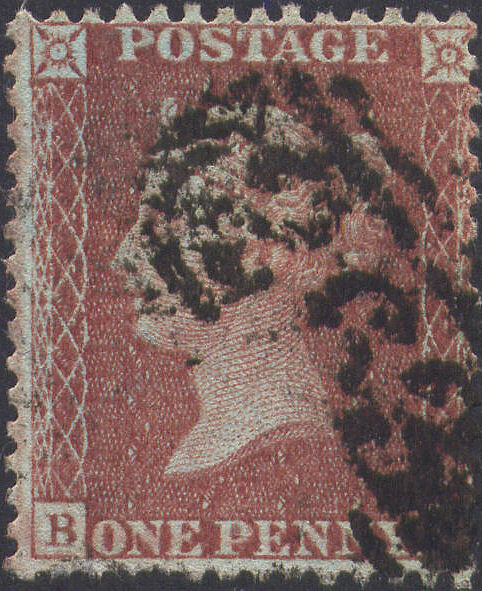 Lower W weak, and 'F' misplaced high left. 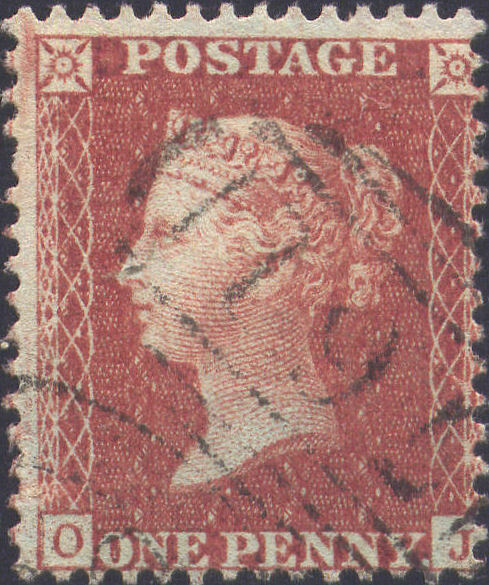 Cat.£185+. 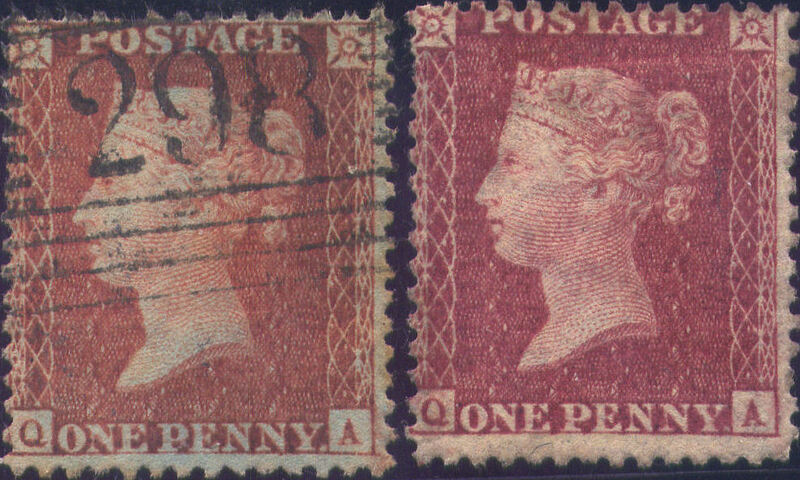 Both ex WIGGINS, a VFU SCARCE MATCHED PAIR, in the SCARCER BRICK-RED on blued, and a FINE SCARCE PRE-FIRE PALE ROSE on TONED/BLOTCHED BLUE paper, both WELL-CENTRED and with FULL PERFS, cancelled respectively with a 'CASTLE STREET' SCOTS LOCAL and a LATE USE STANHOPE (Durham) '81' numeral (Parmenter Rarity 'D' - 'DIFFICULT'). 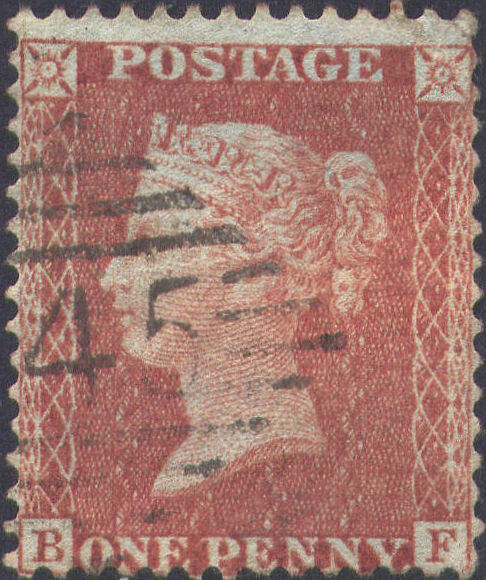 Cat.£125+. 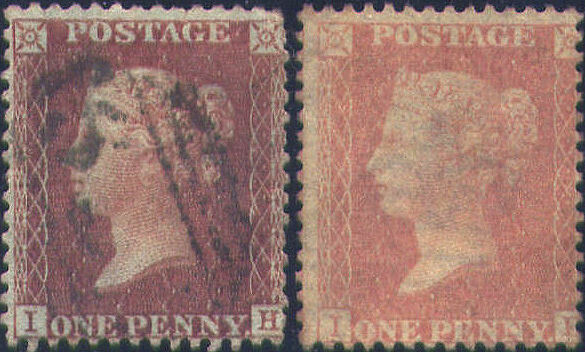 All three ex WIGGINS, a F-VFU SCARCE MATCHED TRIO, in Red-brown and the SCARCER BROWN-ROSE on blued, and a FINE SCARCE PRE-FIRE ORANGE-BROWN on unblued paper, all three reasonably WELL-CENTRED and with FULL PERFS, cancelled respectively with a London Inland '42' numeral, and Nottingham '583', and Hereford '357' SIDEWAYS DUPLEXES. 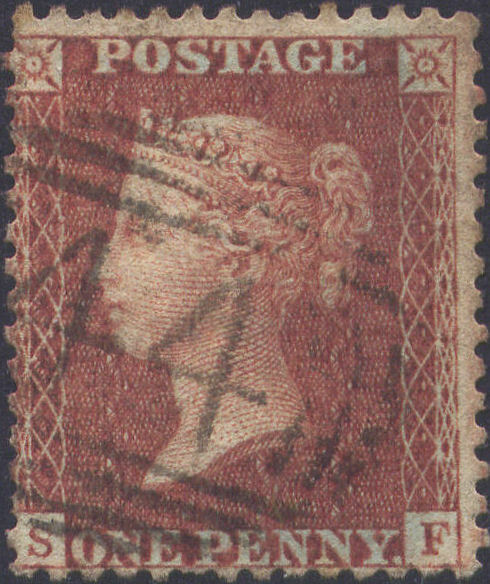 'P' with large loop, and 'J' tilted slightly W. Cat.£247+. 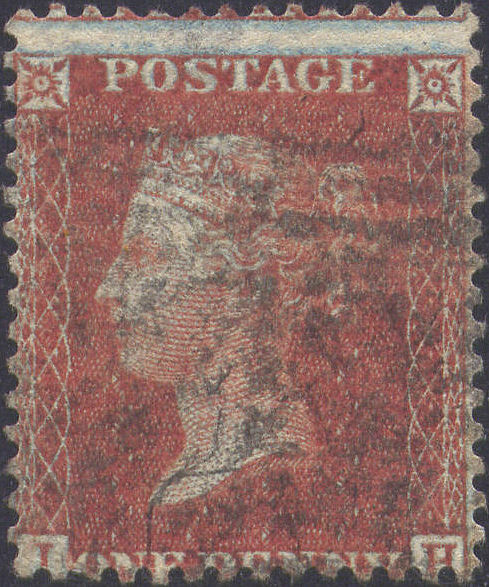 The C8 and C10 ex WIGGINS, a FU+-VFU SCARCE MATCHED TRIO, in Red-brown on blued paper, a PRE-FIRE PALE RED, and a Rose-red on White paper, reasonably WELL-CENTRED, with FULL PERFS, cancelled respectively with London Inland '13', English Provincial, and Scots Montrose '251' numerals. 'I' misplaced right. Cat.£110+. 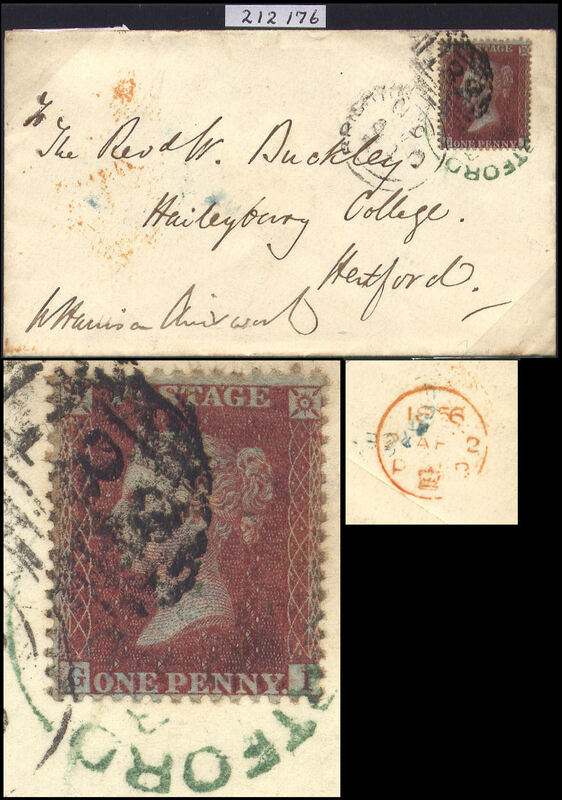 Ex WIGGINS, a VFU single, WELL-CENTRED, with FULL PERFS, lightly cancelled with a neat SCARCE DORKING '257' SIDEWAYS DUPLEX (Barton RARITY 'E' - 'SCARCE'). 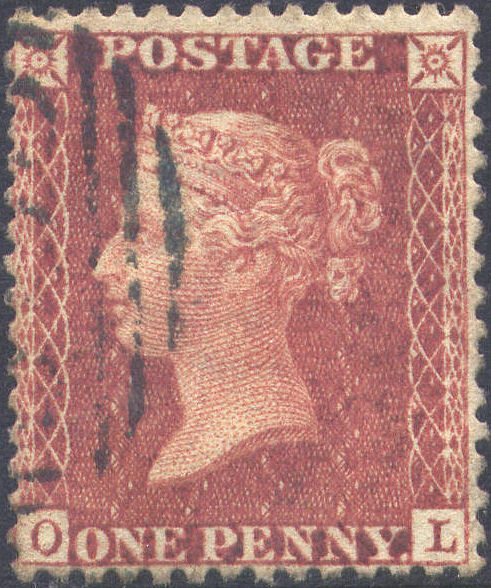 CONSTANT VARIETY: mark in 'O' of 'ONE'; also 'P' misplaced left. Cat.£22++. 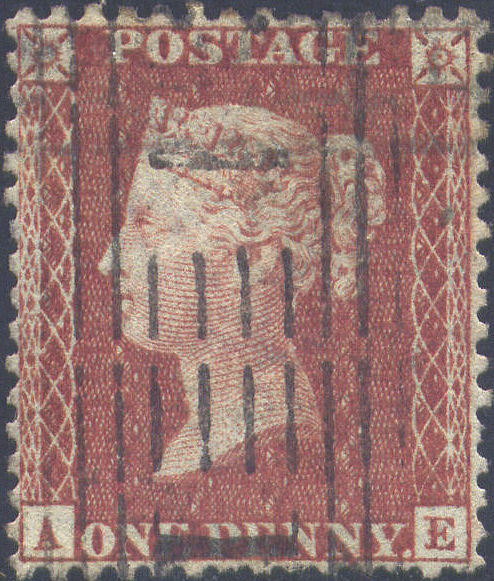 A VFU+ VERY SCARCE HORIZONTAL TRIO from this SCARCER plate, PERFECTLY WELL-CENTRED, with FULL PERFS, cancelled with indistinct English Provincial numerals. 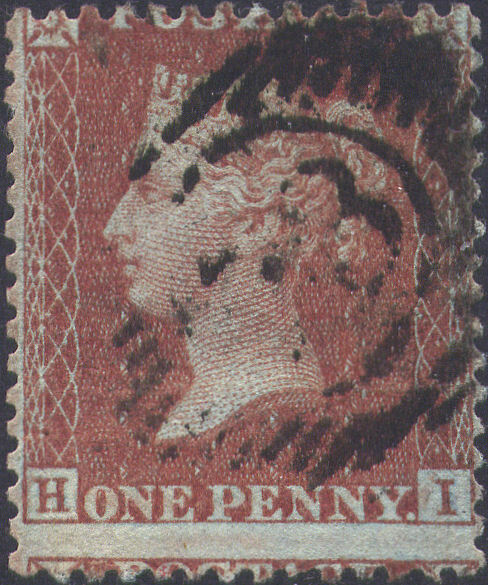 CONSTANT VARIETY 'CH': marks in N margin; also narrow margins between, lower E frame-breaks and NE 1 o'clock Ray Flaws on all three, and base-line weak on 'CG' and 'CI'. Cat.£240++. 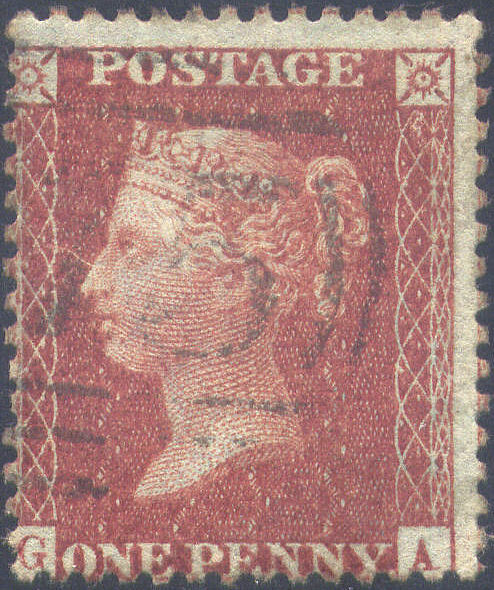 A SPECTACULAR AND RARE fine used HORIZONTAL STRIP OF SIX from this SCARCER plate, off-centre high right, but with FULL PERFS, cancelled with Torquay '805' numerals. 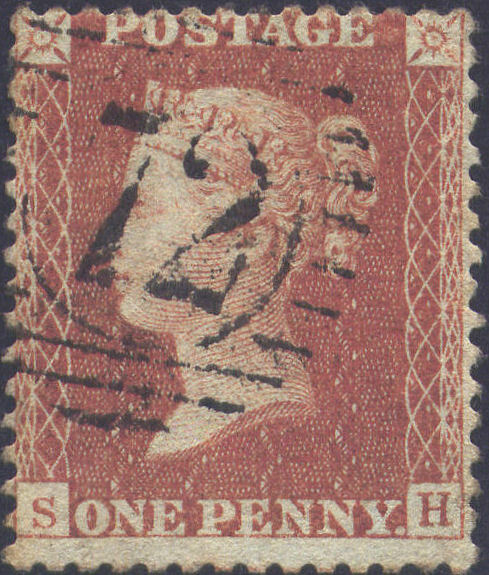 CONSTANT VARIETY 'FF': short serif on W 'F'; also lower E frame-breaks, and blur NW on 'FH'. Cat.£480++. 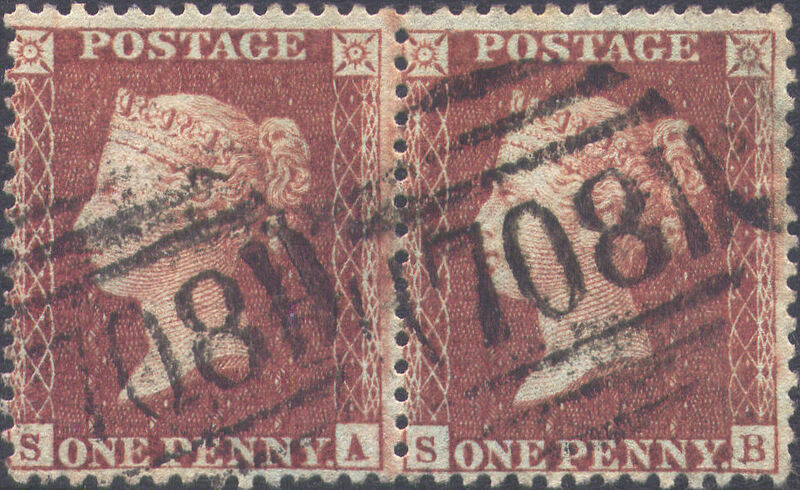 A VFU SCARCE HORIZONTAL PAIR from this SCARCER plate, VERY WELL-CENTRED, with FULL PERFS, cancelled with Shrewsbury '708' numerals. 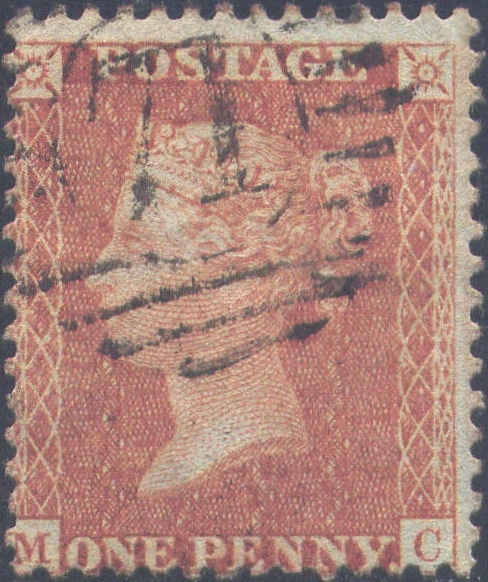 Lower E frame-breaks, NE 1 o'clock Ray Flaws, and blurs E on both; base-line weak and letters misplaced low left, with 'A' blind on 'SA'. 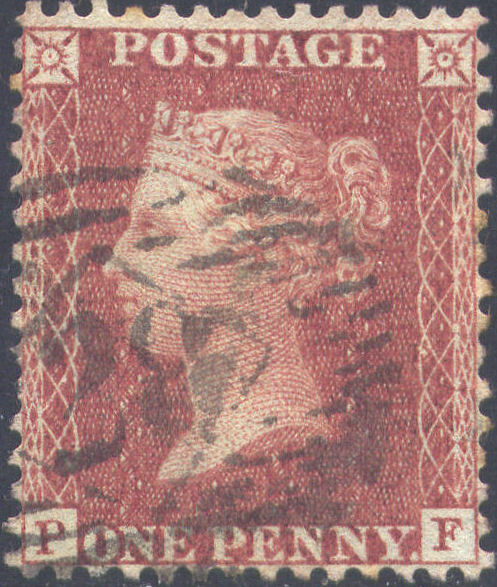 Cat.£160+.